I’m not a CrossFitter, per se, but I suppose you could say that CrossFit is my guilty pleasure. As a biomechanist, I know all about the potential risks of kipping pull-ups and high-rep Olympic lifts. But that doesn’t stop me from enjoying the occasional WOD. The “Benchmark Girls” — Fran, Cindy, and Angie, in particular — are some of my absolute favorite workouts. Above all, I’m an admirer of fine movement. 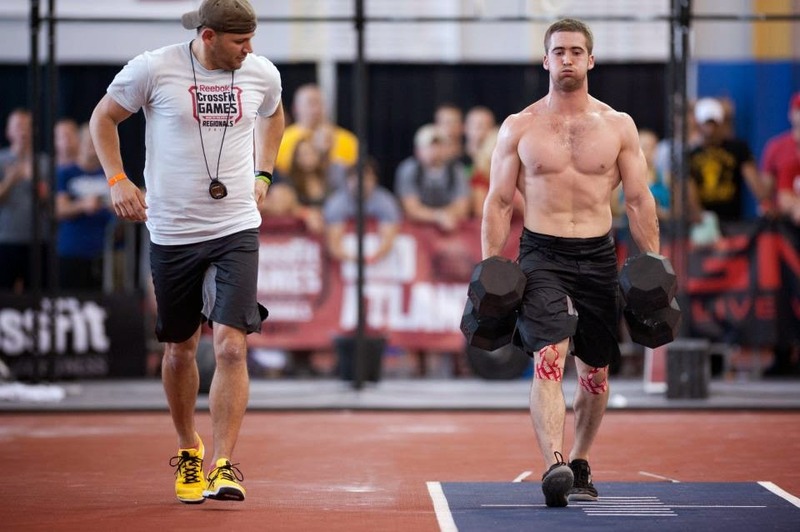 As such, I simply can’t get enough of the CrossFit Games. Call me crazy, but the crispness and grace with which Games athletes perform highly technical movements, especially in the presence of fatigue, really gets me going. So when I found out that Mid Atlantic Regionals were being held a mere two hours southwest, I just had to go see for myself what it was all about. This past Saturday, I drove down to Fairfax, Virginia, to take in Day 2 of the Mid Atlantic CrossFit Regionals. I had high hopes for the day, and I would not be let down. 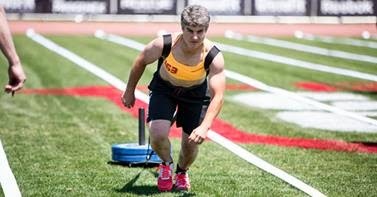 I witnessed firsthand some of the most well-rounded athletes in the world battle it out for a chance to go to the Games this summer. I also saw my conceptions of age, determination, and sportsmanship each redefined in the span of just a few hours. The first thing I noticed upon entrance into the stadium was the level of fitness of the spectators. Make no bones about it: CrossFit is getting a ton of people fit. The crowd on hand for the day was without a doubt the most fit collection of people I’d ever seen. Heck, half the women had bigger guns than I do, and I’m no pipsqueak. The first event of the day was a team workout: three men and three women from ten rival boxes competing in a relay of 9-6-3 reps of handstand push-ups, hang cleans, and burpees. I was immediately struck by what an incredible competitive outlet the “Sport of Fitness” is for so many people. Ten or fifteen years ago, the sport in which these athletes are currently excelling did not exist. Back then, if you liked to workout, maybe you did some bodybuilding or powerlifting. If you were an ex-athlete, at best you went on to play some softball. 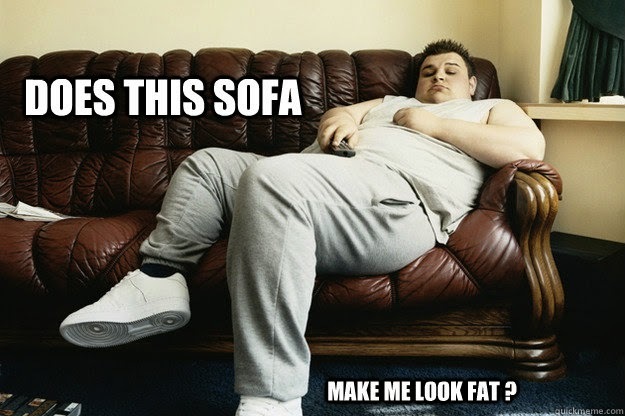 More often than not, though, you probably sat on the couch reminiscing about your glory days and gaining a few pounds with each passing year. CrossFit obviously didn’t invent Olympic weightlifting, gymnastics, and metabolic conditioning. But it has packaged these modalities together in a neat competitive bundle and made it available to the masses. Sure, it’s not for everyone. But it’s definitely for the folks I was watching lay it all on the line in Fairfax this past weekend. After the relays came the individual events. The first of the two workouts consisted of the same exercises as the team event, only for far more reps and with front squats in place of hang cleans. As the first group of ladies trotted out to the competition floor, I noticed one of them was not like the others. It wasn’t a lack of bulging biceps or rippling six pack; those were certainly present. It was that her hair had a little more salt-and-paper than the rest. In fact, at 46 years old, Kim Holway was double the age of some of her competitors. Not that it showed, as Holway took second in her heat. Each heat of women was faster and more enthralling than the previous, with plenty of close calls and last second sprints to the finish. Next came the men. I was most interested in seeing the third Fittest Man on Earth, Ben Smith, in action. Smith did not disappoint, methodically plowing through the first workout and edging out his top competitor in the last three burpees to the thunderous approval of the crowd. Given the grueling combination of exercises, I was rather pleasantly surprised to see the majority of the competitors exhibit near-perfect form on the squats throughout the entire workout, even as the reps piled up. Burpee technique was another story, but energy obviously had to be conserved somewhere. The final event of the day was a simple couplet: 10 rounds of legless rope climbs and 200-foot sprints. Top finishers came in under four minutes; others struggled to get a single rep on the rope. Courage and poise were on display throughout the day, even in the face of unexpected challenges, like the prohibition of the use of legs on the rope climbs and kipping on the handstand push-ups. Even if an athlete couldn’t get up the rope or out of the bottom of the handstand, they never stopped fighting until the clock struck zero. As the last event unfolded, I witnessed the unparalleled sportsmanship unique to CrossFit. Most mere mortals would have collapsed in heaps of exhaustion after this second of two monster workouts. When these athletes finished their last sprint, though, they raced back to the ropes to cheer on their competitors. In the most moving scene of the day, all nine other finishers of the first men’s heat gathered around the rig to will the last man climbing, Jim Crowell, up the rope and to the finish line. What a tremendous example, day, event, and sport. 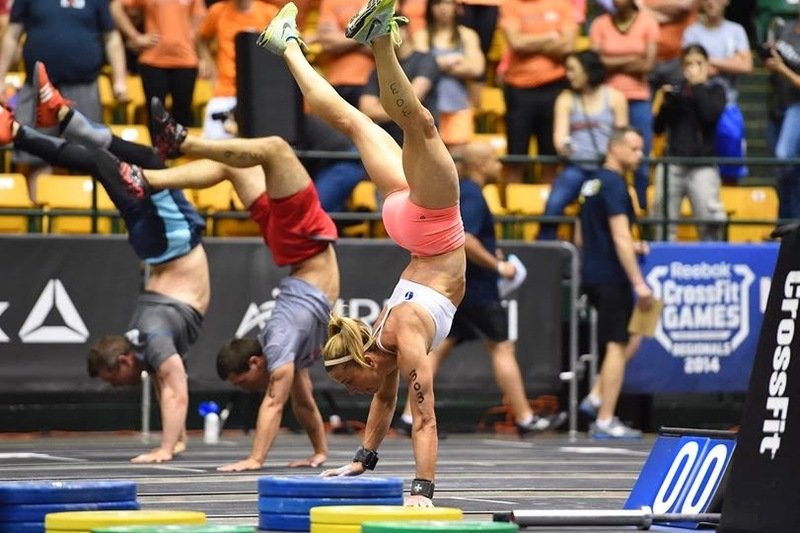 These CrossFitters sure know how to put on a show! Athletes cheering on a competitor after they finished the workout.